RMC Martin Ksohoh is an original Hong Kong brand, founded in 2002. Designed & directed by Martin Ksohoh aka Martin Yat Ming, the product design is based on the concept of exquisite embroidery stitching technique on denim garments. Caring for the environment is our philosophy with the use of “natural colour cotton ” grown naturally in ivory rather than pure white and the base to produce non-wash RMC vintage denim. Tailor made Limited edition collections of fine embroidery technology and three-dimensional embroidery production with attention to detail of design that has leaded the fashion trend in the denim market. RMC JEANS Brand - From the beginning, all RMC Jeans are strictly hand made by craft man with 10 to 30 years of experiences from Hong Kongand Japan. With this high quality and attention on details, RMC JEANS has gained many fans and supports from celebrities like Jay-Z, CHRIS BROWN, JUSTIN TIMBERLAKE,DIZZEE RASCAL, NBA’s LEBRON JAMES, French International Football Superstar DJIBRILL CISSE, Academy Award winner JAME FOXX etc. High-end Los Angeles Boutique Fred Segal had started carrying RMC JEANS in 2005 through their YEAR OF THE TABLE. 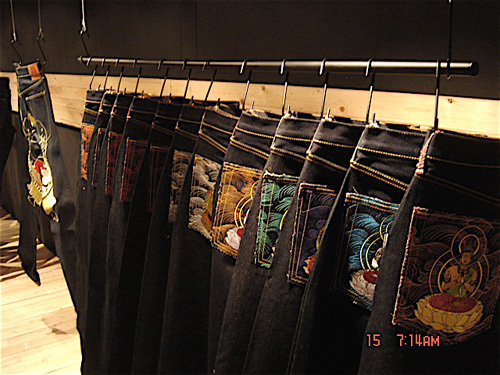 In 2006, RMC JEANS leaded most Denim brands as the 3rd most searched Denim brands on Yahoo search, with many brands imitating its trademark back pocket embroidery style. In 2006, MARTIN KSOHOH produced an embroidery work with 800,000 stitches titled “Tale of the EasternSea”. Based on 6 stories of four seasons and Japan’s EDOera, it was exhibited at the JAPAN DESIGN EXHIBIT and TOKYO DESIGN WEEK which can be described as the challenge to a “Mission Impossible” for the production of a pair of jeans. Designer Martin Ksohoh’s painstaking efforts and the company’s devotional “800,000 stitches” have lifted RMC Martin Ksohoh jeans to new horizons – they are not just jeans, but a piece of art for appreciation. In 2008, MARTIN KSOHOH worked with NEWBALANCE with his other label “YOROPIKO” to release his HUNGER DRAGON design on their model 574 shoes. Each pair of shoes took an average of 48 hours to produce and was released with very limited quantity in the Asia Pacific region. It was sold on EBAYwith a minimum bid of USD2500 and had been exhibited in many countries like Hong Kong, Taiwan, Singapore, Australia, China’s Shanghaiand Beijing. RMC also worked with different companies and creative outlets to produce different products: Golden Horse Award’s winning film “WARLORDS”, McDonald’s BEIJING2008 Olympic special edition , “YES WE CAN” OBAMA Edition, Special Edition for American’s ZERO HULLIBURTON, Hong Kong Vinyl toy artist Eric So, Taiwan’s rapper MC HOTDOG, WORKN PLAY X RMC, AAAA X RMC ,Japan UNLIMITED-FIR Special Edition, Japan YAKULT 40th Anniversary, BEYOND RnR TOUR Special Edition, Jay Chow’s World Tour Special Edition, DIZZEE RASCAL X RMC X YOROPIKO, Japan Manga artist SANTA INOUE – SARU X RMC , London classic EASTMANS X RMC JACKET, Japan traditional Manga GEGEGE NO KITARO X RMC TEEetc. In 2009, the label MKWS was started with design focusing on lifestyle and music. RMC latest introduction is the 15.5 oz denim made in JAPAN. The HANDPAINTED ORIGINAL RED (O.R.) DENIM uses the cutting of the RMC 1001 model with slimmer cut. The details remain but with 2 hand painted stripes painting process which involves the use of special paint, careful execution and repeated touch up. Each painting process took about half an hour to complete. Due to the time consuming painting process, the quantities produced are very limited and available now in four color: Red, Blue, Off White and Yellow. Natural Colour cotton uses no pesticides, insecticides and toxins during the whole process of growth to finished product. In fact, the cotton itself is naturally resistant to pests unlike your average white cotton. As it grows, the cotton gains a natural colour without being genetically modified to match consumer needs. Your normal cotton is usually bleached in order to gain a desired colour to discard the impurities. As no toxins/chemicals are used, the cotton is suitable for any types of skin as it is non-irritant. Natural Colour Cotton can be classed as “green” as it reduces the amount of chemical pollution via industrial wastage as no chemicals are used. As the cotton is hardy, it results in a non-pilling fibre that is vitally important to customer satisfaction. In addition, the stronger, handpicked, more hollow cotton fibre traps warm air close to the skin, giving natural cotton thermal properties far superior to your regular cotton. 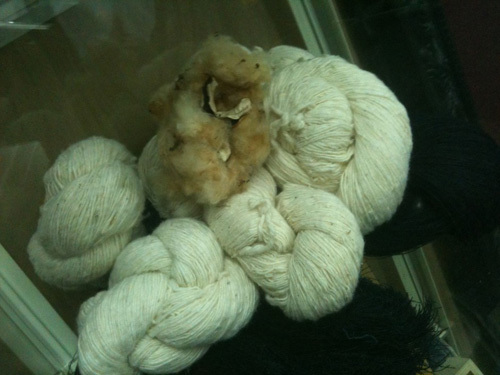 Natural colour cotton is far stronger than normal cotton as it has an improved staple length of the yarn. Normal cotton is susceptible to tears that will lead to unhappy customers and brand dissatisfaction. Natural Colour Cotton has been referred to as second skin by experts. It contains rich vegetable proteins that are beneficial to the human skin. Many customers care for their facial skin, but most are unaware of the benefits of natural colour cotton to their skin overall. It is the use of Natural Colour Cotton that makes RMC Martin Ksohoh Jeans truly the most unique and sought after denim in the World today. RMC jeans brand does not use the modern projectile looms only the old-style shuttle looms which are by far the best and the only old selvedge denim production machines to use and so the story begins. Simply put, this means that in the weaving process, the thread goes back and forth across as a continuous thread, rather than as a separate thread for each cross weave. Therefore, the fabric is more resilient, while the denim side lined with a clean edge is known as the selvedge. Modern yarns are woven with a different edge to the original. The traditional fabric of the loom is narrow, from 28 inches to 34 inches; an ordinary size pair of jeans takes about three yards of fabric. To maximize production by manufacturers and so that the fabric has been used to the edge of the cloth side seam with a straight outside, when the cuff of the jeans is turned up you can see the two selvedge edges where the denim is sewn together (some designs can be seen hidden in the coin pocket). The selvedge seam line colour is usually white with red lines but in earlier manufacturing there was white outside with green lines, yellow lines or more different colours all used in the selvedge edge. In the originals this difference made it easy to distinguish between the different companies factory cloth fabric. In the original style of the jeans they can from the selvedge edge confirm the distinction. In today's market the Japanese selvedge denim production is considered the best as it is the rarest. Historically, the U.S. denim was considered the best. However, because the weaving machines were only 30 inches wide they became obsolete. In 1950 when the U.S. manufacturer of denim jeans saw a surge in demand for products they searched for other faster, more beneficial and cheap ways to produce denim fabric. They abandoned the traditional shuttle looms and used projectile looms, a more modern production accounting for 60 inch wide fabric (or sometimes wider) and their profits grew. Manufacturers then replaced real indigo dye with synthetic dyes and began pre-washing all the fabric to control shrinkage and distortion. The lack of a by-product of these changes the selvedge edge denim character. After the 1980s, Japan's economy bubble burst and took off, many Japanese companies realised there was a market space for traditional jeans. They started in the United States buying the old style shuttle looms, no longer used in the USA and began to re-design distinctive American jeans. In the Japanese apparel company, the "senior Cowboy" craze began to implement a number of visionary companies, but also deliberately introduced the old selvedge jeans and real indigo cloth dyeing. These ancient shuttle looms produced denim lines so natural and irregular, and this unique cloth has also increased the variety of body styles and age. The traditional indigo dye for denim and the dyeing method can also be reproduced. Indigo is dissolved in heated vats and the cotton is dipped several times to build up a dark colour, with airing between each dip, this allows the textile to oxidize and thus fix the colour. The soaking and oxidizing steps are repeated over and over until the final desired colour has been produced. The old original jean production technology is copied at each stage, including the chain-type line of sewing techniques which is given great care and attention and gives the seams a very high quality and robust finish. This requires a special sewing machine. Again, in the past 40 years, no manufacturer has been producing these special sewing machines. And for a long time the primary users of these machines are the most superior denim manufacturers. They use (union special) "Union Special" brand sewing machines, which are the "Rolls Royce" of the U.S. sewing machine, from the 1950s to the modern day no other brand of sewing machine can be a substitute. In the production of old types of jeans there must be a lot of technical input and also detailed description of this unique old denim fabric, from cotton to weaving, dyeing and sewing, to create a superior quality, a necessary condition for any jeans brand. In general the only changes in faded dark blue jeans are through the use of real indigo dye. These details will allow users knowledge of the real authenticity of old denim. Step by step the denim becomes perfected by continuous wear and the natural fabric reduction leaves a unique natural fade, impossible to do under artificial reproduction. RMC brand having learnt from the history of this old cowboy jean has used and increased the fabric technology and its unique design which enhances the natural changes. In owning and wearing a pair of selvedge jeans people will have a very personal experience and nothing else in the world can give you this same experience.